CNEWA’s president Msgr. John E. Kozar visits the students at St. Gabriel School in Saesa, Ethiopia. He made a memorable visit to the Horn of Africa several weeks ago, and shared his impressions — and some beautiful pictures — in the Summer 2016 edition of ONE. This image from May 2015 shows the interior of the damaged Immaculate Conception Church in Suez, Egypt. Vatican Radio reports today on the dramatic rise in attacks on Christians in Egypt. CNEWA’s chair, Cardinal Timothy Dolan, recently made a pastoral visit to India with CNEWA president Msgr. John E. Kozar, meeting with leaders of the Syro-Malabar and Syro-Malankara Catholic Churches and experiencing the richness and diversity of Christianity in India. The Syro-Malankara Church in India has commemorated the 63rd anniversary of the death of Aboon Geevarghese Mar Ivanios, the founder of the rite. Cardinal Timothy Dolan, archbishop of New York, was present at the event as guest of honor. The U.S. prelate came on the personal invitation Cardinal Baselios Cleemis, head of the Syro-Malankara Church and president of the Catholic Bishops’ Conference of India (CBCI). CNEWA’s chair Cardinal Timothy Dolan shares a warm moment with Cardinal Mar Baselios Cleemis, Major Archbishop of the Syro-Malankara Catholic Church, following the liturgy commemorating the death of Mar Ivanios, the founder of the Syro-Malankara Church. Speaking to AsiaNews, Cardinal Cleemis expressed joy for Cardinal Dolan’s presence, noting the long-standing bonds between the Syro-Malankara Church and the Archdiocese of New York. As I am vividly reminded now, the Church is not constrained by race, blood, or maps. Here in India, I can find the same Catholic faith I savor in the Bronx, on Staten Island, or up in Ulster County. Here the Church, while ancient, seems so new, young, and alive. It is still a tiny part of the census of India — maybe only 1 percent of the teeming population — but, it is growing, and it is respected. The rest of India admires the tiny Catholic community for its unity in faith, its devotion to prayer, and its service to the community, especially in its splendid schools, hospitals and clinics, and works of charity. Cardinal Dolan meets schoolchildren at the St. George Parish School in Ernakulam. So much so that the little Church in India is itself missionary, as the world thanks God for the radiantly committed Catholic faithful, priests, and sisters who are serving splendidly in all parts of the Church universal, as we are gratefully aware here in the archdiocese. Visiting my brother bishops, and priests, so many sisters and families here in this subcontinent, is a retreat for me, as I see the oneness, holiness, catholicity, and apostolicity of His Church. A mother and her daughter mourn after the airstrikes carried out by Russian and Syrian war planes targeted a school, in which refugees had taken shelter, in Aleppo, Syria, on 21 July 2016. The city has been under siege for 13 consecutive days. Family members of detained Turkish soldiers wait in front of the Istanbul Justice Palace on 20 July, following the failed military coup attempt of 15 July. The government has launched a massive crackdown on those believed to be connected to the coup attempt. With just 500 active members, including children, Israel’s Hebrew-speaking Catholic community is so small that many Catholics around the world, and most Israelis, do not know of its existence. It endures as a vibrant contradistinction: Catholics celebrating their faith in a country that is overwhelmingly Jewish, worshiping in Hebrew, marking Jewish feasts and traditions, and honoring many local customs. Yet they are undeniably, proudly Catholic. One of the challenges is to continue making the faith resonate, especially among the young. In most Catholic communities around the world, “even the children who stop coming to church return to get married and to baptize their children,” Father Neuhaus notes. “With us, it’s completely different. Once our children stop coming to church, we never see them again. And that’s not all. He is also working to make the church visible in the lives of the immigrant population. 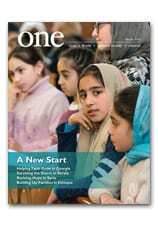 In the Summer 2016 edition of ONE, Diane Handel looks at how Father Neuhaus ministers to migrants in Israel. Together with CNEWA and a number of mostly European Catholic donors, he has founded child care centers to serve Israel’s marginalized communities, especially asylum seekers and migrant workers. That heroic spirit helps carry on part of CNEWA’s mission: to affirm human dignity, encourage dialogue and inspire hope. Want to keep that spirit alive and growing? Visit this link to learn how you can help. CNEWA’s president, Msgr. John Kozar, leads benediction at the Al Bishara School in the Ain Kawa area of Erbil, in Iraqi Kurdistan. He visited the region in April. Follow his journey and see more dramatic photographs in United in Faith, Prayer and Love in the Summer 2016 edition of ONE.